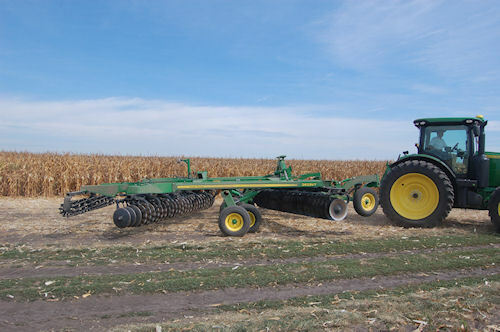 John Deere runs new Vertical tillage machine in demos. Farmers and the rest of the world got the first peek at John Deere's introduction into the vertical tillage implement market at the Farm Progress Show on Tuesday afternoon during the tillage demonstrations. Not introduced in Deere's massive new product introduction in Indianapolis last week, the new model, not yet available to farmers, was unveiled as it churned stalks and soil in the cornfield as thousands of spectators lining the field course watched. 2623 VT from John Deere. The 2623 VT did what Deere spokesmen say it is supposed to do- chop stalks to an acceptable size and begin soil mixing for breakdown, yet leave a considerable amount of residue on the cover. Deere recommends running the tool at 7 to 10 miles per hour, and up to 3 inches deep. None of the vertical tillage tools ran very deep due to dry, hard conditions. A special operating speed class of 7 to 9 miles per hour was created for the vertical tillage tools, including the new Deere entry. All other tillage tools operated at slower speeds. The tool features a hydraulic rolling basket harrow, operated Tuesday in the heavy downpressure setting. It also features forward aft hydraulic adjustment from the cab, and one-point depth adjustment on the front of the machine. The front gang of shallow concave blades do about 60 to 70% of the chopping and sizing of residue. The gang angle is set at 21 degrees. The rear gang angle is fixed at 19 degrees. The new tool is expected to be ready for 2012. It has not yet been released to dealers.